In future wars with near-peer adversaries, the U.S. Army needs to be a self-sustaining force for long periods of time, a panel of experts said at AUSA’s Hot Topic forum on Army sustainment. War brings sustainable strength and mass to bear, said Maj. Gen. Doug Chalmers, deputy commanding general - support for III Corps. “The unique selling point of the U.S. Army is that it’s the only force left in the western world that’s structured to fight and win wars, not just battles,” he said. The Army needs to take a hard look at the basic principles of decisive action and expeditionary logistics, and then adjust them to today’s environment, Chalmers said. Brig. Gen. Charles Hamilton, commander, Defense Logistics Agency (DLA) Troop Support, said one key to sustainment success is understanding the relationship between the military and the industrial base, and creating strategic partnerships. The top priority at DLA, Hamilton said, is having the best planning cycle so that when a need arises, procurement will be rapidly responsive. 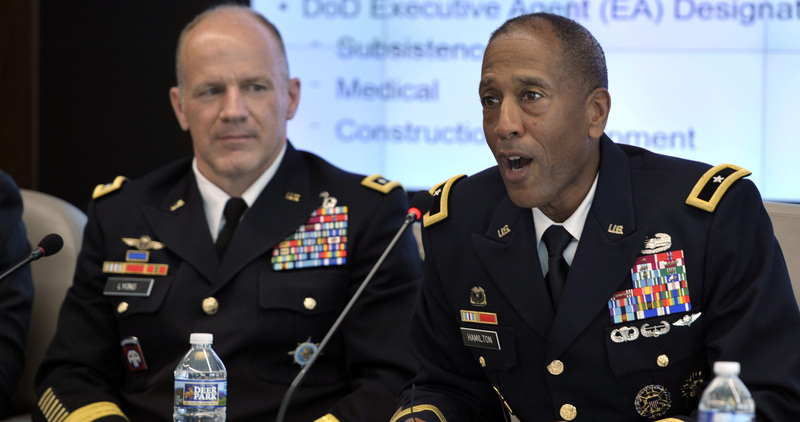 The Army is a decisive force that must be ready to surge against a high-end wartime production output, said Lt. Gen. Stephen Lyons, deputy commander, United States Transportation Command. “Strategic logistics is unquestionably a comparative advantage for the United States,” he said. However, Lyons cautioned, the Army should not automatically assume dominance and superiority in every situation. “The joint operating environment is changing very rapidly,” and the military needs to holistically adjust its warfighting views based on new challenges, he said.